What do gardeners do in the winter? With our vegetable gardens and flower beds put to rest, there is no better time to care for and enjoy birds than winter. 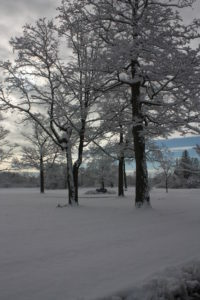 The bare trees and snow-covered surroundings provide very little camouflage, which makes bird activities more visible. Winter is a very fragile time for wild birds so they rely upon us for care and protection. There are no insects flying around for birds to eat in the winter months. Seeds, weeds, fruits, and nuts are often used up or covered in snow. Some birds prepare for the food-scarce months of winter by collecting food in the summer and fall months and hiding it away for later use in winter. Birds return to this stash when natural food sources run scarce. The caveat is that sometimes other birds or animals find the food, too. Some birds eat dormant insects they find in the crevices of tree bark. They also eat berries of winter-hardy species, such as bayberry and juniper. Other birds flock together to find reliable feeders. The ironic part is that though they work together to find these food sources, they are often very competitive with each other once they find it. We can help by stocking feeders with a good source of wild bird seed all winter long. Water is also crucial and scarce in winter. Fewer non-frozen sources of water exist. Though birds can eat snow, it takes much more precious energy for a bird to eat snow and warm it to body temperature. Wintering birds have done quite well in order to survive the coldest months. They’ve also learned to rely heavily upon us for food, water, and roosting spots. The more we chip in and help, the better their chances of survival. This topic was presented at the Dunnville Horticultural Society (DHS) by Gary Cartlidge from Armstrong Milling at our November program night. We have an exciting line-up of interesting topics for our 2017 program nights including: Heirloom Seeds, Pruning Trees and Shrubs, The Art of Bonsai, Vegetable Gardening in Raised Beds, Growing a Healthy Lawn, Bees & Trees, and Floral Design. Our monthly programs are free and open to everyone, members and non-members alike. Join us at the Optimist Hall, 101 Main St. W., Dunnville from 7-9pm on January, 19, 2017 for “Gardening Questions, Answers and Tips” with our own Master Gardeners and host, Deb Zynomirski. This evening is always a favourite program night as we discover how much knowledge we have in our very own group! Come with your questions, gardening challenges, and horticultural dilemmas. Merry Christmas from our DHS Executive: Debbie Thomas-President, Deb Zynomirski-Vice President, Kim Christoff-Treasurer, Sandi Marr-Secretary and Board of Directors: Betty Ballanger, Gloria Hunter, Mary Lou Johnston, Marilyn Stavinga, Margaret Bottrell, Wray McLean, Robert Marr, Denise Richardson, Petra Kruis-Daly. Not a gift was being given, not even a card. With hopes that St. Nicholas soon would repair. The pitchfork still shiny, but handle it lacked. I could see poor old Santa, looking confused. No gardening gifts were under the tree. And gardening gifts are the quickest to get. Give something to make the garden grow better. It’s not a dumb diamond, but a sparkling new tool. It’s a pile of manure that’ll make gardeners swoon. Give night crawlers, not nightgowns, a hose that sprays water. It’s better than any designer-brand shirt. Under his glove, he hides a green thumb. His boots stomp on slugs, (he gives them no breaks). For the rest of the year it’s as easy as pie. ‘Till spring when the blooms are his real enjoyment. Seeds, plants and tools, Santa holds them all dear. But visit a nursery, stress-free shopping is there. And his voice fills the night with loud Hoe! Hoe! Hoe! We wish you and your loved ones a very Merry Christmas and may we all continue to be blessed with good health in the coming year! -from your DHS 2017 Leadership Team: Debbie Thomas, Deb Zynomirski, Sandi Marr, Kim Christoff, Betty Ballanger, Gloria Hunter, Mary Lou Johnston, Marilyn Stavinga, Margaret Bottrell, Wray McLean, Rob Marr, Denise Richardson, and Petra Kruis-Daly. “It’s beginning to look a lot like Christmas” in downtown Dunnville. Some eager volunteers with the Dunnville Horticultural Society (DHS) shared their creativity to fill our town pots with nature’s beauty. 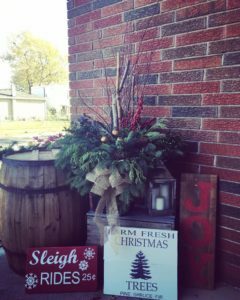 The fountain area and flowerpots are brimming full with evergreens, birch, sumac, wild thistle, curly willow and dogwood …..not to mention some cheery red ribbon added by the BIA. If you are inspired by these beautiful pots, why not consider making your own “porch pot” arrangement this season. What a great way to welcome neighbours, family, and friends to your home during the holidays. Recycle one of your pots from the summer or fall. Fill it with soil and add some greens. This is a perfect time to trim your boxwood bush, spruce tree, curly willow or dogwood. If you don’t have birch branches, white spray paint does wonders on a twig or branch. 1. Gather supplies: clippers, gloves, pots, soil, plant material, “bling” if desired. Observe where the pot will be seen. Fill pot with soil and remember to water your arrangement until the soil freezes. 2. Choose and insert your thriller (birch, dogwood) into the centre. 3. Add filler and spiller (evergreen). 4. Add “bling” (ornaments, ribbon) if desired. The dollar store has great bling! Be sure to pay attention to: colour, texture, height, balance/symmetry, and fullness. Group items together rather than spreading them out for greater impact. Always use odd numbers; they look more natural. Let your arrangement “flow” and “move” rather than looking stiff & rigid. Don’t have too much happening. Less is MORE! Know when to stop creating. Our eyes need a “place to land.” Step back and look at it from a distance. Most of all, enjoy the creative process. Throughout the year, enjoy nature’s beauty with friendly folk from the Dunnville Horticultural Society (DHS). Our monthly programs are free and open to everyone, members and non-members alike. Join us at the Optimist Hall, 101 Main St. W., Dunnville from 7-9pm on January, 19, 2017 for “Gardening Questions, Answers and Tips“ with our very own Panel of DHS ”Master Gardeners” and host, Deb Zynomirski. This evening is always a favourite program night as we discover how much knowledge we have in our very own group. Come with your questions, gardening challenges, and horticultural dilemmas. Call Debbie Thomas, President at (905) 774-3064 or Deb Zynomirski, Vice President at (905) 774-8453 for more information or visit http://dunnvillehortsoc.gardenontario.org.